Dataedo imports foreign keys and displays them in Relations tab. To describe foreign keys edit text in description field. Sometimes, a logically existing relation is not physically coded in database. Similar logical constraints may also exist on views. Dataedo allows you to add them both to your tables and views by using user-defined keys. Note: User-defined relations exist only in Dataedo repository and are not populated back to database schema. To add user-defined relation (foreign key) for your table/view go to Relations tab and click Add relation button on the ribbon or from context menu under right click. Description - you may provide description of your relation. This is the same field as in the table of relations. Once you provided all the fields click OK to add a relation. New relation will be added to the table of relations. Note that user-defined relations have icons with a blue man ( ). To edit key select key in the table and click Edit key button on the ribbon or from context menu under right click. Regular or user-defined relations are used to draw Entity Relationship Diagrams. 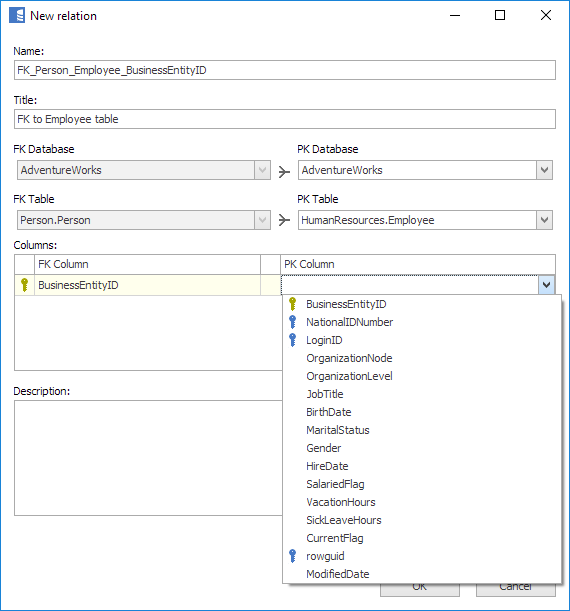 See Creating cross-database table relationships.